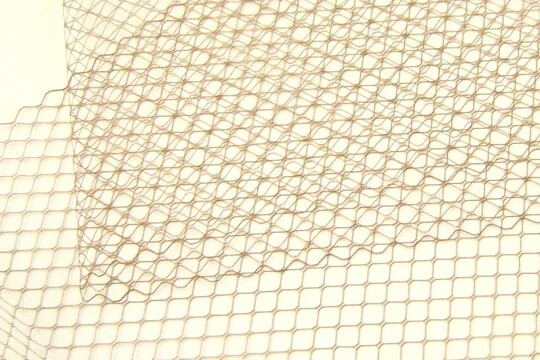 French veiling is no longer made. At one time it was all the rage, being produced in silk, rayon and a blend. Although it is made of nylon, it is as soft as silk or rayon. The distinctive café au lait color is like a brownish-taupe. The pattern is the traditional 5/16 inch diamond pattern. The diamond pattern lends an old-fashioned feel to the veil. The veiling is 9 inches wide. We love it not for just making poofs and fascinators and bird-cage wedding veils - but, it's a great backdrop in your shrines and mini-shrines - or, indeed, to cover a portion of your altered artwork! How to Order: This veiling is cut to order and is sold in half-foot (6 inch) sections, cut as one piece. So, if you order a quantity of 3 you'll get one long piece - 18 inches (1-1/2 feet). To order an entire yard, please order 6 pieces.